Open: Friday-Sunday:1-4p.m. • Monday:10 a.m.-1p.m. We invite you to come visit because the museum and public gardens are yours to explore and enjoy. And we are creating the Wilfred Lyons Memorial Archive, using donations to properly preserve, store and exhibit Cambria's irreplaceable treasures of the past. Ongoing litigation in what has been called the state's longest probate kept the Guthrie-Bianchini House in limbo until 1999 when a Superior Court judge's order settled Bianchini's estate. 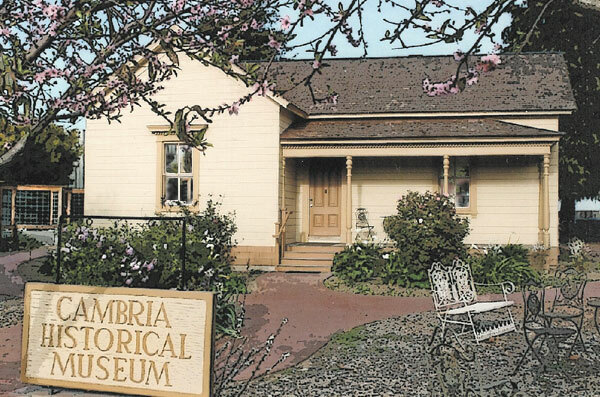 The Cambria Historical Society purchased the property in 2001, with the goal of creating a museum. During the ensuing years, CHS worked to restore the house. After several years of planning and obtaining the necessary permits, the original "salt box" portion of the house was totally disassembled. All of the parts removed were carefully documented by Cambria Historical Society volunteers and stored on the property. Where possible, these parts were reused when the house was rebuilt. Or, if they could not be saved, they were used to fabricate duplicate parts. On July 14, 2004, the remainder of the house was lifted up about eight feet and a stem-wall foundation was built for the entire structure. On October 20 of that year, the house was lowered onto its newly constructed foundation. The house was stabilized to prevent further deterioration, but rehabilitation work was temporarily suspended due to lack of funds. In late 2005, a grant from California State Parks enabled CHS to resume work. Early in 2008, another grant provided by The Hind Foundation helped complete the restoration. In October, 2008, the San Luis Obispo County Planning Department issued a certificate of occupancy. Two months later, the Cambria Historical Museum was opened to the public.